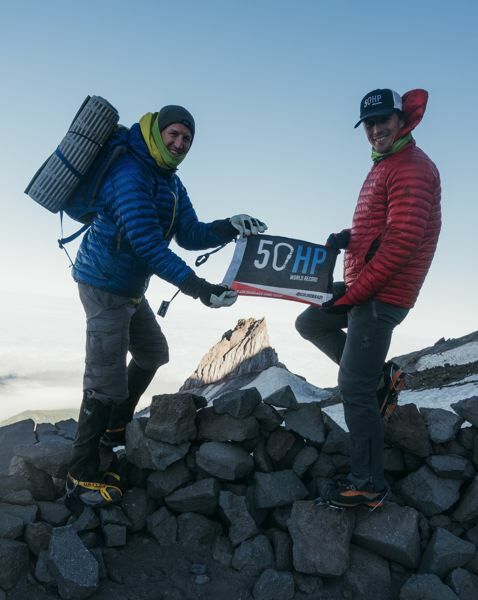 Because climbing the highest peaks on seven continents just wasn't enough for Colin O'Brady, he had to go and climb to the highest points in all 50 states, didn't he? Yes, he did, and O'Brady finished at the top of Mount Hood on Thursday, July 19, setting another world record in the process. Since summiting Mount Denali in Alaska, O'Brady needed only 21 days to climb the highest peaks in each state, shattering the previous record from 2016 by 20 days. It was called the 50-State High Points. He started training for it in January, and everything went smoothly, other than navigating some drought, lightning strikes, high winds and 26-hour climbs. "It's been a bit of a whirlwind," says O'Brady, a Portland resident, along with wife Jenna Besaw, and a former collegiate swimmer and triathlete. "The record began when we reached the first peak (4 p.m. Alaska Time, June 27), Denali; you naturally climb the hardest first." His trek to do the Explorers Grand Slam, climbing the highest peaks on all seven continents (as documented by the Portland Tribune), ended with a climb up Denali, where it's 20,310 feet at the peak. "We got caught up in some storms there, but there was only seven days on the mountain," O'Brady says. "Then it was the mad dash to get out of Alaska, and less than 24 hours I was in Hawaii." He climbed Mauna Kea (13,802) on the Big Island — not bothered by spewing lava from Kilauea. From there, he went to the southeast and East Coast of the United States, where the high points were decidedly lower (Cruise America, one of his sponsors, provided him with an RV). In Florida, Britton Hill really taxed him — not — as it stands 345 feet above sea level. "I was wearing flip flops and took a picture in a grassy field next to a plaque," he says. There was Mount Katahdin (5,276) in Maine, the northern terminus of the Appalachian Mountains, as well as Mount Mercy (5,344) in New York and Mount Washington in New Hampshire (6,148). The Midwest didn't present "too many super challenging" hills/peaks/mounds. Traveling far, he had the use of a private plane, courtesy of his main sponsor, Standard Process, a nutritional supplement company which also gave him access to doctors along the way. "(The past week) was the crux of the project," O'Brady said last Thursday. "I did more than 150 miles on trails, 60,000 feet of climbing and I had two hours of sleep per night." There was Mount Whitney in California (14,505), Mount Elbert in Colorado (14,439), Gannett Peak in Wyoming (13,804), Humphreys Peak in Arizona (12,635) and other peaks, then finishing with Mount Rainier in Washington (14,411) and Mount Hood (11,250). "There was a lot of physical exertion," said O'Brady, 33, upon finishing. "I'm quite tired right now. The most sleep-deprived I've ever been. I found the energy somehow ... I need a nap and shower, but I'm feeling good overall." By today, he's probably fully recovered. O'Brady was thrilled to climb all 50 peaks, in part because he had company. He had people climb with him on nearly every venture, including six people on Mount Hood. His father joined him on four climbs. O'Brady envisions somebody trying to beat his 21-day record, but "hopefully I've set the standards too high. … But records are meant to be broken." In all, he walked, ran, hiked and climbed more than 300 trail miles. "Nothing can really prepare you for the sheer exhaustion and physical strain that this kind of rapid push creates," he says. 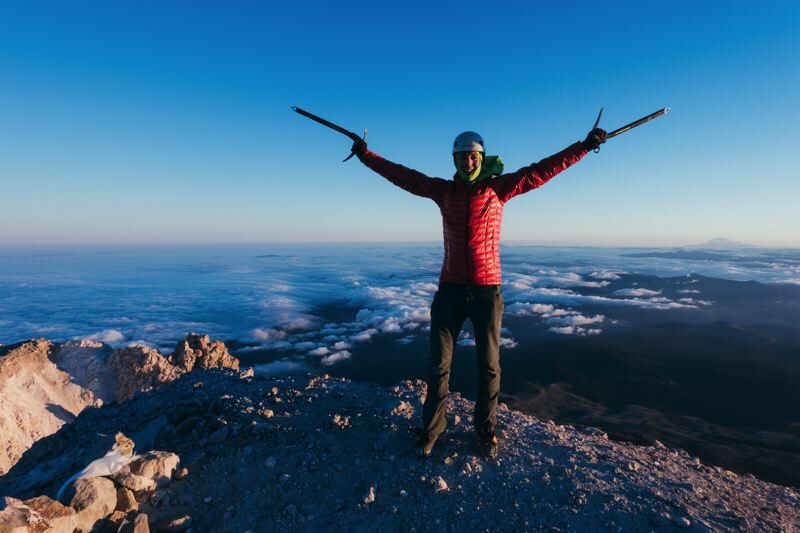 "It was an ambitious goal, wanting to knock out all 50 peaks in just 21 days. But it really does take a village." He has another big project planned, but he's not ready to announce anything, yet. "I'm going to enjoy the success of this project and honoring the people around me ... and taking a nice nap." His previous world records came in the Explorers Grand Slam and Seven Summits speed records. "Colin is definitely always trying to push his body; he's an athlete at heart. But the general inspiration is to get people into the outdoors," Jenna Besaw, his wife, says. "Think big, dream big. Our nonprofit is focused on that. "This has become our full-time work. It's great to have incredible sponsors, and a brand created around him. It's just an awesome way to live." For more on O'Brady and the 50-State High Points, see http://www.colinobrady.com/50hp.